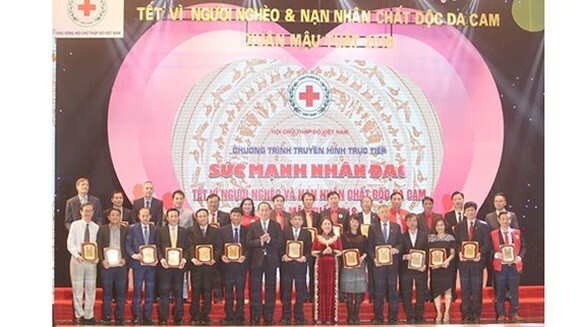 The Vietnam Red Cross Society (VRC) organized an art program raising fund for the poor and Agent Orange/dioxin victims on the upcoming Lunar New Year in Hanoi on January 7, marking the 20th anniversary of its movements. Attending at the event were President Tran Dai Quang, Head of the Mass Mobilization Commission of the Party Central Committee Truong Thi Mai, President of the Vietnam Fatherland Front Central Committee Tran Thanh Man. Speaking at the event, President Tran Dai Quang affirmed that the implementation of social and human policies is one of the Party and State's important missions. He asked the Party organizations in local authorities to strengthen VRC’s tasks and raise awareness of people of human activities. Launched in 1999, the annual art program raising fund for the poor and Agent Orange/dioxin victims had presented nearly 10 million Tet gifts worth VND3.464 billion in the past five years.